Developing novel technologies for wireless nanodevices and nanosystems is of critical importance. So far, innovations for delivering nanoscale power source are almost non-existent, while huge emergent needs for nanoscale sensing devices continue for biological sensing and defense applications. Therefore, it is essential to explore innovative approaches and nanotechnologies for converting mechanical energy (such as body movement, muscle stretching), vibration energy (such as acoustic/ultrasonic wave), and hydraulic energy (such as body fluid and blood flow) into electric energy that will be used to power nanodevices without using battery. Recently, we have demonstrated an innovative approach for converting nano-scale mechanical energy into electric energy by piezoelectric zinc oxide nanowire (NW) arrays [Science, 312 (2006) 242-246], providing a new path way for building self-powered nanosystems. Based on this principle, piezoelectric-field effect transistor, piezoelectric gated diode, sensors and resonators have been fabricated, which are the fundamental components of nano-piezotronics. Piezotronics is a field of using piezoelectric effect for fabricating novel and unique electronic devices and components. Developing novel technologies for wireless nanodevices and nanosystems are of critical importance for in-situ, real-time and implantable biosensing, biomedical monitoring and biodetection. Nanosensors are currently under intense development for ultrasensitive and real-time detection of biomolecules. An implanted wireless biosensor, for example, requires a power source, which may be provided directly or indirectly by charging of a battery. It is highly desired for wireless devices and even required for implanted biomedical devices to be self-powered without using battery. So far, most of the research has been focused on developing novel nanodevices and nanostructures. As we know that any small size devices would require a power source. The nanorobotics, for example, could be an ideal design for repairing cells. But such nanorobotics would not function if there is no power. Therefore, the next forefront research in nanotechnology is to develop self-powered nanosystem/nanosensor, which is a full package that harvests energy from the environment and operates by itself. Nanodevices usually operate at a power of nano-Watt to micron-Watt. Our requirement is to find paths that can generate small scale electrical energy for powering these devices. However, innovations for delivering nanoscale power source are almost non-existent, while huge emergent needs for nanoscale sensing devices continue for biological sensing and defense applications. Therefore, it is essential to explore innovative nanotechnologies for converting mechanical energy (such as body movement, muscle stretching), vibration energy (such as acoustic/ultrasonic wave), and hydraulic energy (such as body fluid and blood flow) into electric energy that will be used to power nanodevices without using battery. It also has a huge impact to miniaturizing the size of the integrated nanosystems by reducing the size of the power generator and improving its efficiency and power density. Nanowires (NWs) and nanobelts (NBs) of inorganic materials are the forefront in today’s nanotechnology research. Among the known one-dimensional nanomaterials, zinc oxide (ZnO) has three key advantages. First, it exhibits both semiconducting and piezoelectric properties, providing a unique material for building electro-mechanical coupled sensors and transducers. Secondly, ZnO is relatively bio-safe and biocompatible, and it can be used for biomedical applications with little toxicity. Finally, ZnO exhibits the most diverse and abundant configurations of nanostructures know up to today, such as nanowires, nanobelts , nanosprings, nanorings , nanobows and nanohelices . Although numerous studies have demonstrated novel nanodevices and applications based on NWs and NBs, little work has been done to address the power needs for these nanosystems, especially self-powering, wireless operation and miniaturization of the entire integrated system. In our recent research, we have developed for the first time a novel approach of converting mechanical energy into electric power using aligned ZnO nanowires. The operation mechanism of the power generator relies on the coupling of piezoelectric and semiconducting properties of ZnO as well as the formation of Schottky barrier between the metal and ZnO contacts. To study the effect, we grew arrays of zinc oxide nanowires (Fig. 1A) . The nanowire arrays were grown using a standard vapor-liquid-solid process in a small tube furnace. First, gold nanoparticles were deposited onto a sapphire substrate placed in one end of the furnace. An argon carrier gas was then flowed into the furnace as zinc oxide powder was heated. The nanowires grew beneath the gold nanoparticles, which serve as catalysts. Then, we used an atomic-force microscope tip to deflect individual wires (Fig. 1B) . As a wire was contacted and deflected by the tip, stretching on one side of the structure and compression on the other side created a charge separation – positive on the stretched side and negative on the compressed side due to the piezoelectric effect. The charges are preserved owing to a formation of a Schottky barrier between the tip and the nanowire. When the tip lost contact with the wire, the strain was released (Fig. 1C), we measured an electrical current. The coupling between semiconducting and piezoelectric properties results in the charging and discharging processes when the tip scans across the nanowire. This is the process of the nanogenerator [5, 6]. Figure 1. Piezoelectric nanogenerators based on aligned ZnO nanowires. (A) Scanning electron microscopy images of as-grown ZnO nanowires on sapphire substrate. 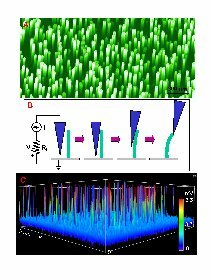 (B) Schematic experimental procedure for generating electricity from a nanowire using a conductive atomic force microscope (AFM). (C) Piezoelectric discharge voltage measured at an external resistor when the AFM tip scanned across the nanowire arrays. The energy to be fed into the nanogenerator is likely to be mechanical energy, which could be supplied from the environment. The principle and technology demonstrated have the potential of converting mechanical movement energy (such as body movement, muscle stretching, blood pressure), vibration energy (such as acoustic/ultrasonic wave), and hydraulic energy (such as flow of body fluid, blood flow, contraction of blood vessel) into electric energy that may be sufficient for self-powering nanodevices and nanosystems. The nano-generator could be the foundation for exploring new self-powering technology for in-situ, real-time and implantable biosensing, biomedical monitoring and biodetection, with great potential for defense and civil applications. Based on this principle, piezoelectric-field effect transistor , piezoelectric gated diode, sensors and resonators have been fabricated, which are the fundamental components of nano-piezotronics. Piezotronics is a field of using piezoelectric effect for fabricating novel and unique electronic devices and components. 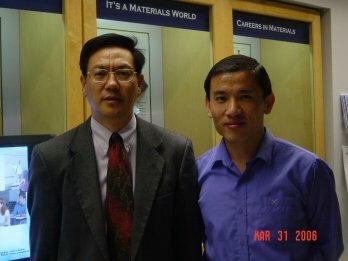 Professor Zhong Lin Wang (left) and Jinhui Song (right) at Georgia Institute of Technology (USA) invented the nanogenerator.